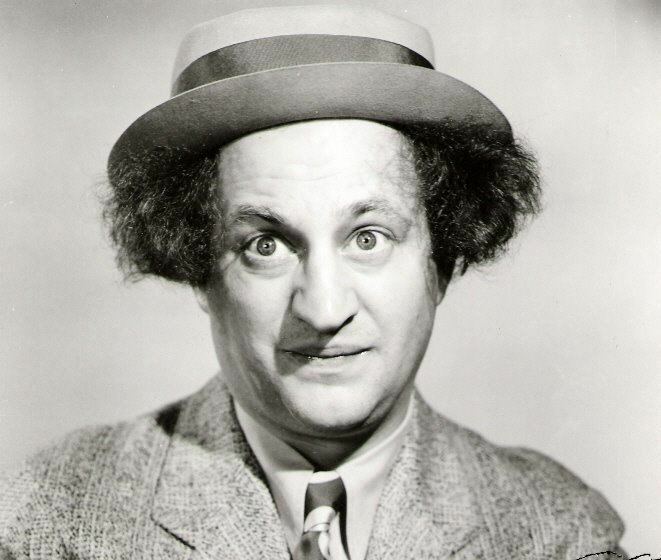 Born October 5, 1902 (1902-10-05) Philadelphia, Pennsylvania, U.S.
Louis Feinberg (October 5, 1902 – January 24, 1975), known professionally as Larry Fine, was an American actor, comedian, violinist and boxer, who is best known as a member of the comedy act The Three Stooges. Fine was born to a Russian Jewish family at 3rd and South Street in Philadelphia, Pennsylvania on October 5, 1902. His father, Joseph Feinberg, and mother, Fanny Lieberman, owned a watch repair and jewelry shop. In his early childhood, Fine's arm was accidentally burned with acid. His father used the acid to test jewelry for its gold content. On one occasion, the young Fine mistook the acid for a beverage and raised the bottle to his lips. Before he could drink any, his father knocked the bottle from Fine's hand, splashing Fine's forearm with acid and causing extensive damage to it. His parents later gave Fine violin lessons to help strengthen the damaged muscles in his forearm. He became so proficient on the violin that his parents wanted to send him to a European music conservatory. However, that plan was thwarted by the outbreak of World War I. Fine later played the violin in the Stooge films. 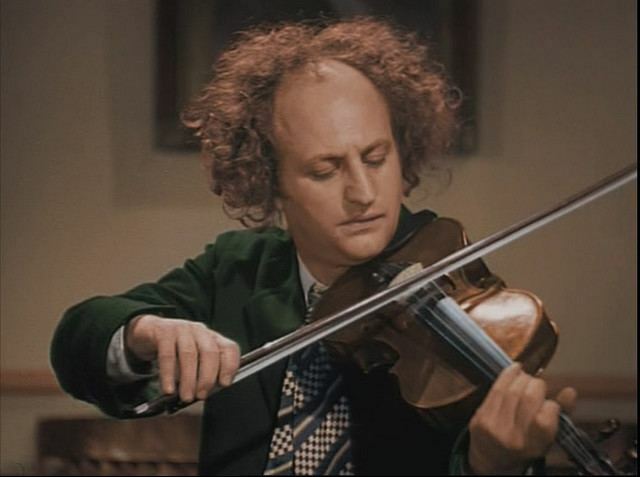 In scenes where all three Stooges are playing fiddles, only Larry is actually playing, while the other two are pantomiming. To further strengthen his damaged arm, Fine took up boxing in his teens, winning one professional bout. His father, opposed to Larry's fighting in public, put an end to his brief career as a boxer. At an early age, Fine started performing as a violinist in vaudeville. In March 1928, while starring as the master of ceremonies at Chicago's Rainbo Gardens, Fine met Shemp Howard and Ted Healy. At the time, Healy and Howard were performing in the Shubert Brothers' A Night in Spain. Since Howard was leaving the play for a few months, they asked him to be a replacement 'stooge. Fine joined Ted's other stooges, Bobby Pinkus and Sam 'Moody' Braun. Howard returned in September 1928 to finish Spain's national tour. In early 1929, Healy signed a contract to perform in the Shuberts' new revue A Night in Venice. Healy brought Fine, Shemp Howard, and Moe Howard together for the first time as a trio. "Moe, Larry and Shemp", with Fred Sanborn, appeared in Venice from 1929 through March 1930. Fine, Shemp Howard, and Moe Howard toured as "Ted Healy & His Racketeers" that spring and summer, and then went to Hollywood in the summer to film Fox Studio's Soup to Nuts (1930). Fine and the Howard brothers broke up with Healy after Soup to Nuts and toured as "Howard, Fine and Howard: Three Lost Soles" from the fall of 1930 to the summer of 1932. In July 1932, Fine and Moe Howard teamed up with Healy again, adding Curly Howard to the group. The new lineup premiered at Cleveland's RKO Palace Theatre on August 27, 1932. Shemp Howard split off to pursue a solo career. "So Healy said 'Would you like to be one of the stooges and make three instead of two?' And Larry said 'Yes, I would love that.' Healy said, 'I'll give you ninety bucks a week.' 'Fine.' He also said, 'I'll give you an extra ten dollars a week if you throw that fiddle away.'" This is presumed to be a fictionalized account, as Moe Howard wasn't present for that moment in March 1928, having "retired" from show business in July 1925 to go into real estate with his mother. He did not return to performing and Ted's act until December 1928. Fine's backstage visitors that day were Ted Healy, Shemp Howard and Bobby Pinkus. Beginning in 1932, the Three Stooges made 206 short films and several features, their most prolific period starring Fine, Moe Howard and Curly Howard. However, their career with Healy was marked by disputes over pay, film contracts, and Healy's drinking and verbal abuse. Fine and the Howard brothers finally left Healy for good in 1934. 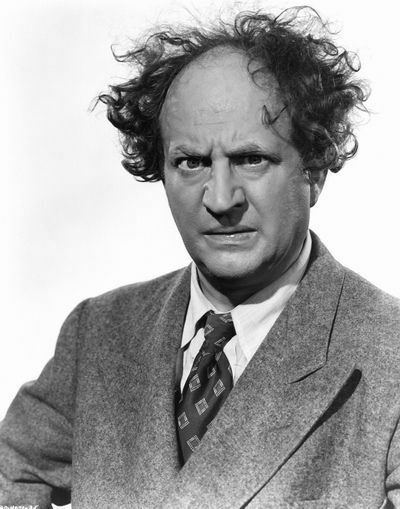 In many of the Stooge shorts, the Larry character did more reacting than acting, staying in the background and serving as the voice of reason in contrast to the zany antics of Moe and Curly. He was a surrealistic foil and the middle ground between Moe's gruffly "bossy", and Curly's childish personae. Like the other Stooges, Larry was often on the receiving end of Moe's abuse. His reasonableness was the perfect foil to Moe's brusque bluntness and Curly or Shemp's boyish immaturity, but Larry would sometimes propose something impossible or illogical and be quickly put down by Moe, both verbally and physically, who would often react by pulling a handful of hair out of Larry's head. In early 1945, Curly began suffering minor strokes, though he suffered a more serious one on May 6, 1946. This forced Shemp to temporarily join the Stooge act again until Curly could recover. Curly recovered enough appear in Hold That Lion! (1947), in a cameo appearance (the only Three Stooges film to contain all three Howard Brothers: Moe, Curly, and Shemp). Curly did another small role in Malice in the Palace (1949), but his scenes in that short were deleted due to his illness. Curly died on January 18, 1952, at 48 years old. On November 22, 1955, Shemp died of a heart attack while returning home from a boxing match, at age 60. Joe Palma played a fake Shemp role until Joe Besser succeeded him. 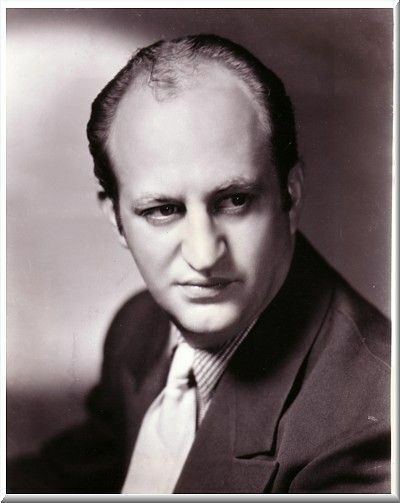 When the Stooges left Columbia in 1958, Joe DeRita replaced Besser. In the earliest Stooge two-reelers (and occasionally the later ones), the Larry character frequently indulged in utterly nutty behavior. Fine would liven up a scene with a random improvised remark or ridiculous action. In the hospital spoof Men in Black (1934), Larry, dressed as a surgeon and wielding a large kitchen knife, chortles: "Let's plug him... and see if he's ripe!" In Disorder in the Court (1936), a tense courtroom scene is interrupted by Larry breaking into a wild Tarzan yell. Of course, after each of his outbursts, Moe would gruffly put him down. According to Fine's brother, Fine developed a callus on one side of his face from being slapped innumerable times by Moe. The Larry character's on-screen goofiness has been described as an extension of Fine's own relaxed personality. Director Charles Lamont recalled: "Larry was a nut. He was the kind of guy who always said anything. He was a yapper." Writer-director Edward Bernds remembered that Fine's suggestions for the scripts were often "flaky", but occasionally contained a good comic idea. The Three Stooges became a big hit on television in 1959, when Columbia Pictures released a batch of the trio's films, whose popularity brought them to a new audience and revitalized their careers. Fine is sometimes erroneously reported to be the father of sportscaster Warner Wolf, who is in fact the son of Jack Wolf, one of several other "stooges" who played in Ted Healy's vaudeville act at one time or another. 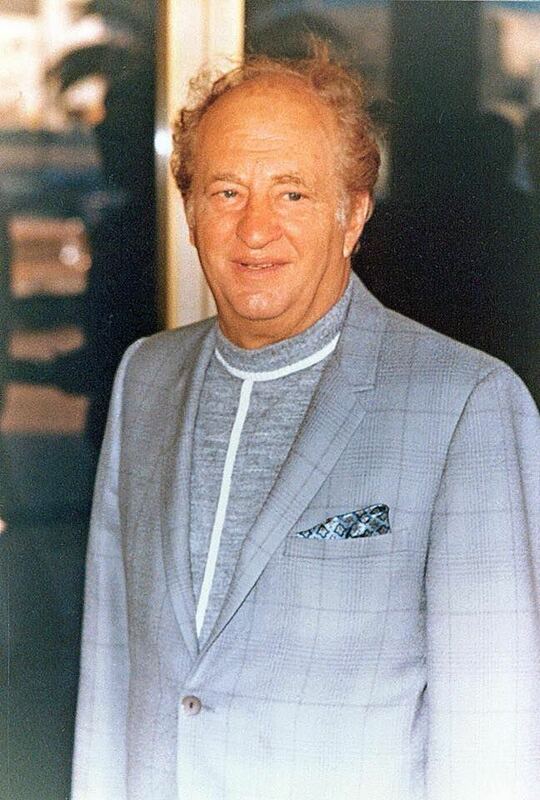 Fine is the father-in-law of actor and Los Angeles television personality Don Lamond, best known for hosting the Stooges shorts on KTTV for many years. In 1965, Fine, Moe Howard, and Joe DeRita started a new TV comedy show entitled The New Three Stooges, a mixture of live and animated segments. While the show produced good ratings, the men were too old by this point to do slapstick comedy well. Fine began showing signs of mental impairment, such as frequent trouble delivering his lines properly. A few years later, the men started working Kook's Tour, a new TV series. On January 9, 1970, Fine suffered a debilitating stroke that paralyzed the left side of his body. This event marked the end of his performing career. Fine eventually moved to the Motion Picture Country House, an industry retirement community in Woodland Hills, where he spent his remaining years, and used a wheelchair during the last five. Even in his paralyzed state, Fine did what he could to entertain the other patients. Fine also completed his "as told to" autobiography Stroke of Luck, Fine received visits from his old partner Moe Howard. Fine remained accessible to Stooge fans, regularly hosting them despite his disability. When asked if spending his life as a Stooge was enjoyable, he would comment "it wasn't fun: it was work — but it paid off good, so I enjoyed it." Like Curly Howard, Fine suffered several additional strokes before his death on January 24, 1975, at the nursing home in Woodland Hills, at age 72. He was interred with his wife, Mabel and son, John in a crypt at Glendale's Forest Lawn Memorial Park Cemetery in the Freedom Mausoleum, Sanctuary of Liberation. Fellow Stooge Joe Besser is interred in a grave a short distance away from the Freedom Mausoleum. Moe Howard died over three months after him. The Three Stooges have a star on the Hollywood Walk of Fame in honor of their contributions to the motion-pictures industry at 1560 Vine Street in Hollywood, dedicated on August 30, 1983, with ex-stooge Joe Besser in attendance. 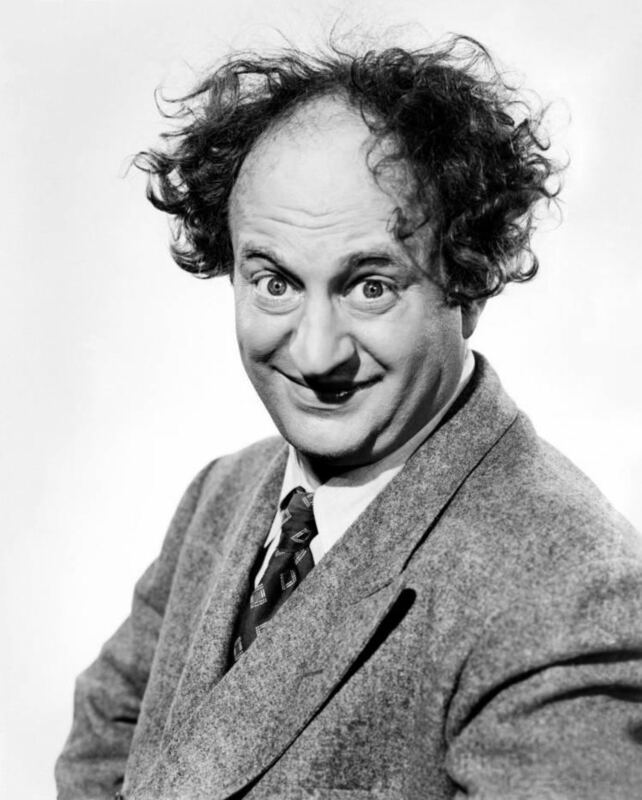 In the 2000 made-for-TV movie, Larry Fine was played by Evan Handler. A large mural of Larry Fine appears on a wall at the busy intersection of 3rd and South Streets, near his birthplace in Philadelphia. The effort to create a mural on that site began when a local weekly newspaper suggested that the city should somehow honor him. Dedicated on October 26, 1999, with Fine's sister in attendance, that mural showed Larry with a peculiar look on his face. In May 2006, a similar mural showing Larry with a more animated expression and playing a violin was painted over the original mural. This mural stands over Jon's Bar and Grill with a sign reading "Birthplace of Larry Fine." On October 15, 2009, the Associated Alumni of Central High School in Philadelphia inducted Fine into that venerable school's Hall of Fame, even though he never graduated. A member of the Central Alumni Hall of Fame Committee pointed out, "Many people are not even aware that Mr. Fine was a Philadelphian and that is a part of what we’re trying to do." In the 2012 Farrelly brothers' film The Three Stooges, Larry is portrayed by Sean Hayes of Will & Grace fame. Young Larry is portrayed by Lance Chantiles-Wertz.